MURSHIDABAD, NAWAB SIR SAYYID HASAN ALI KHAN BAHADUR, G.C.I.E., Nawab Bahadur of. 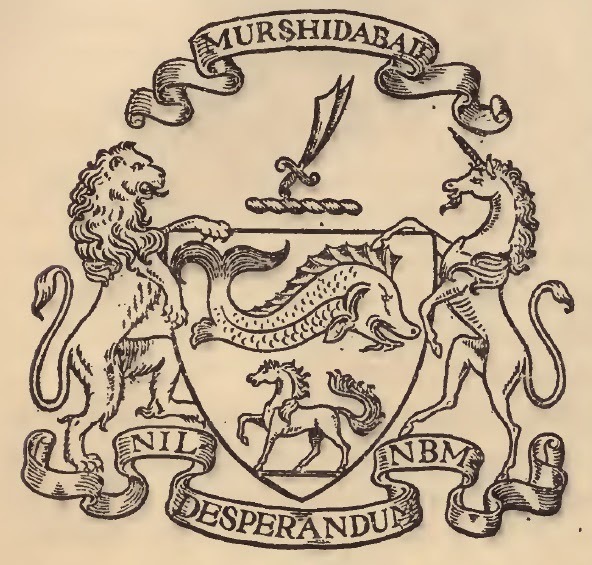 The family arms adopted by the Nawab are argent, a dolphin proper above a cheval regardant, also proper. Below the shield the monogram N.B.M. The supporters are the lion and the unicorn. The crest is a Zulfikdr (sword of the Khalif Ali) proper. The motto is "Nil Desperandum".